Population trends, distribution, status and strategies for genetic improvement and conservation of the savanah muturu on free range in the Benue trough of Nigeria. A field study was conducted in Benue, Kogi, Nasarawa, Taraba and Niger states of Nigeria to determine the population trends, distribution and status of the savanah Muturu in Nigeria. An inventory of the savanah Muturu and their distribution was carried out in the five states of Nigeria. The study revealed that the populations of the Savanah Muturu had been eliminated in Kogi, Taraba, Nasarawa and Niger states. Savanah Muturu populations of 1600 heads were found in Benue state that were distributed in ten (10) local government areas. It was also identified that the Savanah Muturu is endangered and may go into extinction if appropriate and urgent conservation strategies are not applied to the herds. A cooperative breeding scheme is proposed for adoption to catalyze self-help type management focusing on overall improvement in addition to conservation techniques. For successful implementation and sustainability of the rural cooperative breeding technology, a structure to ensure that members acquire the capacity for the holistic ownership and management must be put in place. Conservation, Distribution, Genetic, Improvement, Population, Savanah-muturu. The Nigerian Muturu breed is a variety of the West African short horn is also known as the Nigeria short horn. The forest muturu in the south-west and savanna muturu in the middle belt and eastern parts of Nigeria are the two types in Nigeria . The Nigerian muturu were classified as almost extinct . The muturu cattle is hardy and can be reared under low management levels, without adverse effects on their productivity maintaining good body conditions by grazing and browsing throughout the year . The breed was also reported to be trypano-tolerant . Muturu cattle breeds have significant cultural values . Since the second half of the first millennium B.C, muturu cattle were the most wide-spread cattle breed in Nigeria until the Fulani invasion in 1820 . Most of the muturu cattle of Nigeria belong to the savannah type, they were known to spread over the Benue plateau and smaller numbers are found further to the southwest in Oyo and Kwara . The distinction between the strains of the muturu breed is not yet clear, however had classified the muturu cattle breed into four separate cattle populations, namely Ghana Dwarf -muturu, Liberia Dwarf -muturu, Nigeria Dwarf forest muturu (also called Kiroli) and Nigeria savannah muturu. The number of muturu cattle in 1990 in Nigeria was between 75,000 to 120,000 for the dwarf or forest muturu and 50,000 to 80,000 for the savannah muturu [8,9]. The trypanotolerant muturu cattle breed is one of the least known cattle breed in West-Africa . Its population, distribution, morphological characteristics and performance have received little publications . The muturu were once reported to be distributed widely across the West-Africa sub region Figure 1 [11,12]. The savannah Muturu is a rare local cattle breed found in the guinea Savannah zone of Nigeria comprising of Niger, Plateau, Kogi, Nasarawa, Benue and Taraba States of Nigeria. At present, the Savannah Muturu is reported to occur in the central states of Nigeria (Figure 2) (Kogi, Nasarawa, Taraba, Plateau and Benue States). The pressure on pasture with the white Fulani and economics of production had diminished the populations of the Savannah Muturu in Nigeria . Breeds population survey establishes reliable estimates of breed population and geographical distribution of the breeds so that regular monitoring will record how these changes with time. A number of livestock breeds such as the muturu, are at risk of extinction . At present national data and information system for indigenous animal genetic resources of Nigeria are under develop. 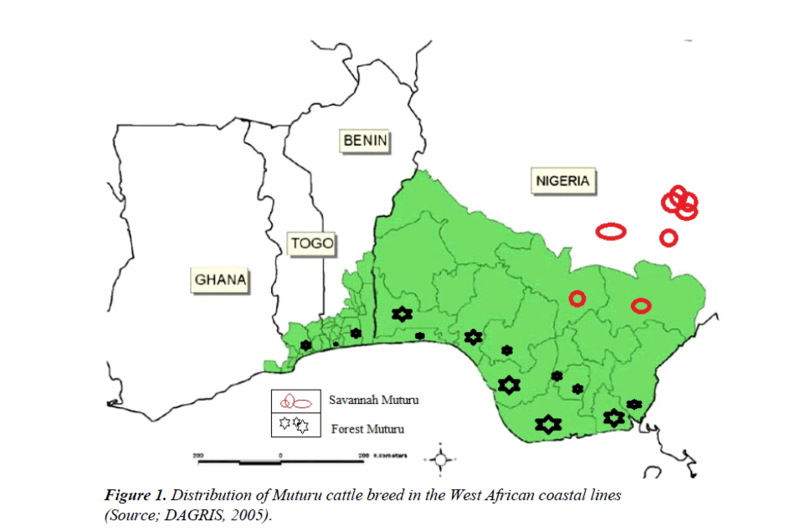 Figure 1: Distribution of Muturu cattle breed in the West African coastal lines (Source; DAGRIS, 2005). 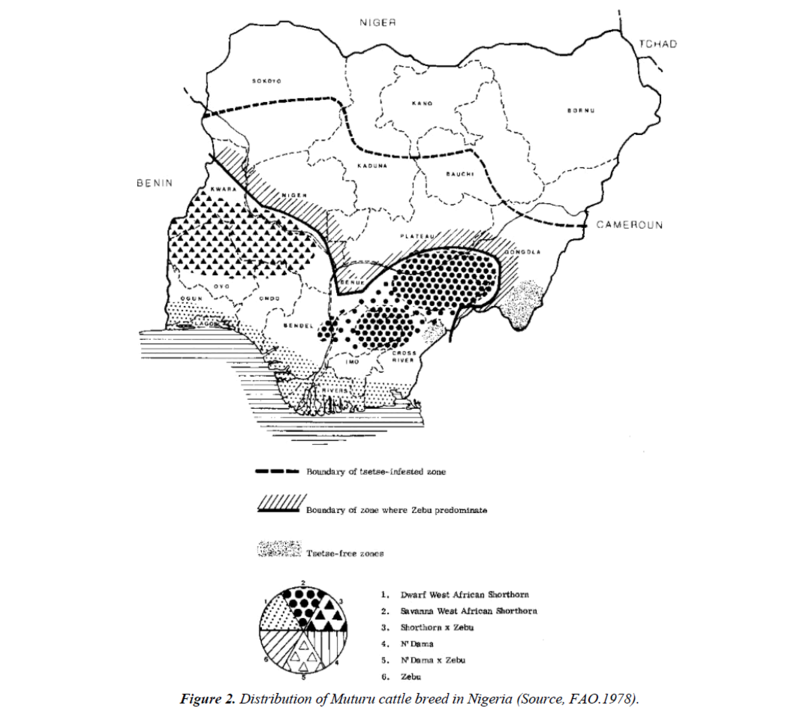 Figure 2: Distribution of Muturu cattle breed in Nigeria (Source, FAO.1978). Threat to indigenous animal genetic resources availability and abundance may occur in many ways such as epidemics, droughts, flood, indiscriminate crossbreeding, inbreeding and replacement by exotic breeds. Other threats to indigenous animal genetic resources may be sudden like armed conflicts and other environmental emergencies that would require a quick response . Genetic diversity of indigenous livestock has the potential to ensure food security and rural development in most developing nations. Most developing countries do not currently have data on their indigenous animal genetic resources. The population status of many indigenous breeds is still unknown, and the problem may thus be underestimated . Without information on breed population, it might be impossible to strategically plan interventions to a rest breed erosion in developing nations. Either attention may be focus on a few high output breeds while others may be threatened or heading towards extinction. Policies affecting socio-economic changes leading to transformation of production systems, livelihood patterns and traditional system into external input oriented systems encouraged the use of modernization at the expense of traditional indigenous animal production systems . Loss of indigenous animal genetic resource diversities reduces essential resources available to rural farming communities to cope with the impacts of climate change, pest and disease outbreaks and a new growing consumer demands . Replacement of indigenous breeds with their crossbreds or exotic breeds could result in the loss of products and services preferred by rural people. There had been high pressures on the existence of the Savanah Muturu from the larger zebu cattle, climate change impact, cross breeding, high rate of inbreeding and reduced use of the breed by rural farmers due to modernization . While there is no current information on the population size, population trends, distribution and status of the savannah muturu in Nigeria, its worthy to note that the population of the savanah muturu may have declined over the years. Giving the rising climate change impact and uncertainties in future environmental challenges, there is need to conserve the genetic resources of indigenous livestock breeds with high capacity for adaptation. This will maintain their co adapted gene complexes for current and future use. The sustainable use of indigenous breed through traditional management system will alleviate rural poverty, mitigate climate change impact and may serve as rural community-driven development strategy . In view of the importance of the savanah muturu and its potential for current and future use, there is need to provide information on its existence, population size, population trends, distribution and population status . The objectives of this study were to investigate the presence of the savannah muturu, its population size, trends, distribution and to make a case for the introduction of rural cooperative breeding scheme for genetic improvement and conservation of the savanah muturu reared on free range under rural farming communities in Nigeria. The study was carried out in Taraba, Nasarawa, Kogi, Benue and Niger states of Nigeria. In Benue the study was carried out in five local government Areas of logo, Kwande, Buruku, Ushongo and Tarka. Benue state is located within the lower river Benue trough in the middle belt region of Nigeria. Its geographic coordinates are longitude 7o47´ and 10o 0´ east, latitude 6o 25´ and 8o 8´ north. The state has extensive plains of less then 150 m above sea level. The areas are flat to nearly level and undulating with the eastern part of the state having an altitude of the 1200 m above sea level. The climate of the area is the tropical climate with distinct wet and dry seasons. The rainy season commences in April to October with mean annual rainfall range of between 800-1500 mm. The temperature fluctuates between 17. 6oC- 37.0oC while relative humidity is dependent on seasons but ranges from 50% to 80% being lowest during the dry season and highest during rainy season. Ayilamo is a rural community located at a boundary between Wukari of Taraba State and Logo Local Government of Benue state. And the study also include some selected parts of Tarkaa local government such as Mbaayogh, Mbakyagh–Mbahar council ward. The community is located at latitude 70 461 21’’ N and longitude 90 71 29’’ E with an altitude of 217 m. It has temperature range of 240–320c, and a relative humidity of 65% to 82%, precipitation of 35%-40%. The terrain in the environment is generally very variable with Neutral soil pH. (5.5–8.5) there is natural vegetation of tree cover making up 45%. The areas have a management environment that is grass–land base (ranching) with a mixed system of agriculture (crop and livestock). Animal in these communities are confine mostly at night. The animals that were used for the research were savannah muturu cattle comprising both sexes and ages. The total number of the animals used for the research were 138, comprising of 35 number of males and 103 number of females. Out of the total number of the animals, thirty six (36) were calves, nineteen (19) were breeding bulls, 56 were breeding cows and twenty seven (27) were heifers. There was no castrated bull among all the samples. The populations were drawn from Logo and Tarka local government area of Benue State. The animals were managed under free range with no supplementary feeding, there is no evidence of veterinary care for the animals. The study was carried out in two phases. In phase one, a survey by use of questioner was administered to rural farming communities that were associated with rearing of savanah muturu cattle. Phase two was a field study having identified muturu rearing communities in phase one. A One on one discussion and oral interview of farmers who were reported to had reared the muturu cattle but had no animals during the study was also carried out. The reasons for discontinuing the rearing of muturu cattles were sought. Rural farmer communities that had muturu animals on ground, inventory of the herd were taken. An inventory of the entire population of savanah muturu cattle was also carried out. Photographs of savanah muturu cattle were taken from various herds using digital cameras. GPS Gadget were used to identify the location of the herds. Population size of Muturu cattle herd sizes, composition / herd proportion such as; number of breeding males, number of breeding females, number of calves, number of castrated males or males not to be use for breeding and number of replacement heifers. Data were collected on individual herd size, herd composition, loses due to mortality (age group most affected), attempt to retain heifers for replacement, use of bulls of other breed (Bunaji) for serving the muturu dams and population size. Data collected were subjected to descriptive statistics and analysis of variance to measure the effects of the parameters listed above. The study indicated that populations size of the savanah muturu in Nigeria was about 1,600 found only in Benue State of Nigeria. The populations of savanah muturu in Nasarawa, Taraba, Kogi and Niger states of Nigeria had all being eliminated (Figure 3). 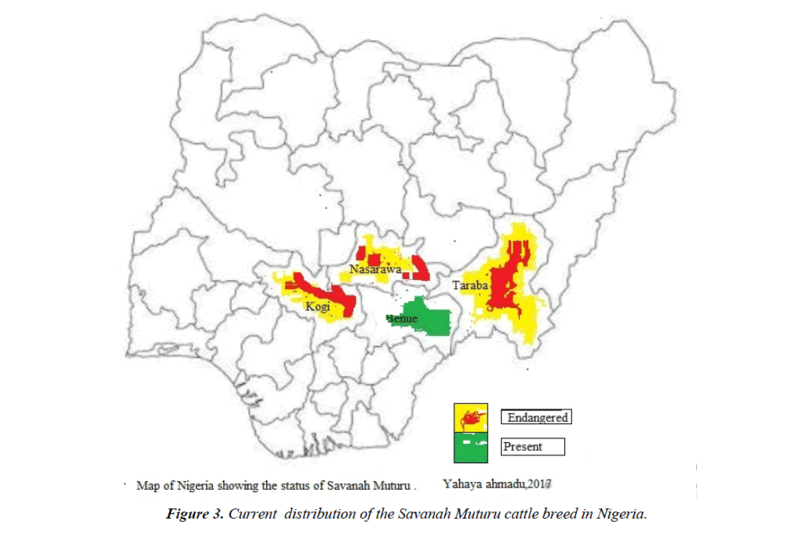 Figure 3: Current distribution of the Savanah Muturu cattle breed in Nigeria. The study indicated that the savanah muturu is only found in the Benue trough (Benue state) of Nigeria. In Benue state, the savanah muturu is found in only ten local government areas of the state (Figure 4). Logo local government area had the highest number. The levels of cross breeding with the zebu was equally highest in logo local government area compared to the other local government areas. The total number of the savanah muturu was about 1600 heads, Out of these, some were crossbreds others highly inbred. 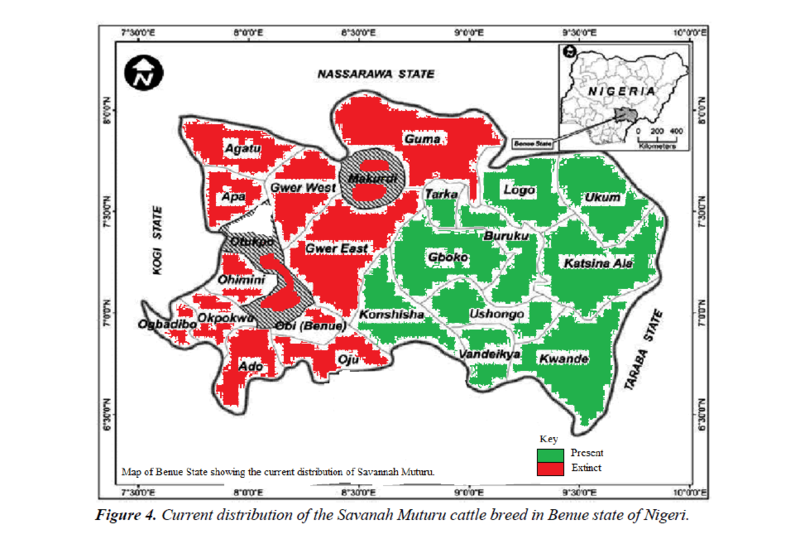 Figure 4: Current distribution of the Savanah Muturu cattle breed in Benue state of Nigeri. The savanah muturu in Nigeria is highly endangered and threaten for extinction. The population had declined from 80,000 [8,9] to 1,006. The distribution of the savanah muturu in five central States of Nigeria had now being restricted to six Local Government Areas in the Benue trough of one state (Benue State) of Nigeria. The Nigerian savanah muturu is highly endangered and no doubts on its way to extinction unless urgent steps are taken to conserve and improve it performance. These steps must include not only conservation and genetic improvement strategies, but as a must value chain intervention and value addition strategies, capacity building of rural farmers to apply genetic improvement, value chain and addition methods themselves. Creation of stable markets for competitive pricing and prices which will wholistically develop an economic driving force that will not only motivate muturu farmers, but may attract more rural farmers to go into savanah muturu production. This will enhance sustain use of the breed “the best conservation strategy”. • Low economics of production. Animal breeding is an art and skills design to identify the best animals and how to breed the best animals such that their descendants performance and products will be, if not “best” at least better than their parental generations for the use of man . This involves genetic principles and animal breeding technologies. Unfortunately, while the rural farmer is aware of the best animals in his herd at his level, he is completely unaware of the genetic principles and breeding technologies required to improve the descendants of his best animals. Herd sizes are often limited by economic resources available to the rural farmer. Animal breeding is dominated by science, technology, rapid development of computer on information technology, which had major impact on rates of genetic improvement, data collection and genetic evaluation procedures in animal populations. The application of these, on animal populations under rural farmers are grossly limited. There is need to develop a breeding technology that can be applied on production populations on free range under rural farmers either on individual herd or on pooled populations. There is therefore need to introduce to the Muturu rural farmers the cooperative breeding technology for breeding genetically superior cow and bull calves for replacement and subsequent genetic improvement and conservation of the savanah muturu populations among rural farmers. Animal breeding for genetic improvement of local breeds on free range under rural farming communities hardly fits into the complex biotechnology and computer driven information management, data collection and genetic evaluation procedures in animal populations. The challenges arose due to small herd sizes, population sizes and inability to keep records on animal performance. This makes it very difficult to identify the best animal (s) in the herd, also that the small herd sizes do not give rooms for effective selection. Animal breeding technique employing genetic principles can still be applies to these rural small size populations. The challenge is that the quality of the breeding program may not be evaluated at the onset, because the expected rate of genetic improvement and inbreeding could not be estimated from the base generation because phenotypic records on desired traits are often not available. Hence, neither the stochastic nor the deterministic methods could simulate nor determine respectively the phenotypic values of individuals in the base generation. As the breeding program progresses, participating rural farmers are able to provide records of their animals on desired traits due to capacity building. This will allows the quality of the breeding program to be evaluated. Cooperative breeding groups are village-level community organizations where small livestock owners pull their herds together to improve their genetic merits by selective breeding [20-22]. Small holder livestock owners are unable to implement selective breeding within their individual herds because of small herd sizes, uncontrolled grazing and mating systems. The rural muturu farmers are also as individuals, unable to attract value chain interventions, access finance, inputs and services. Genetic improvement programs, grazing land management and disease control programs are often challenging to manage at individual levels and when most villagers will not work together. These had accounted for the high mobility of diseases and mortality rates, losses or dilution of genetic resources of rural livestock herds. The economies of scale of the rural livestock production of individual farmers are often poor, as they do not have access to profitable markets, pricing and prices are not competitive as well as lack of value addition activities. The village cooperative scheme are channels or entry points for introducing valueaddition activities and value chain interventions that would enable the rural livestock farmers to key into the agricultural revolutionizing policies of the Nigerian government. Cooperative breeding for sheep and goat have being successfully initiated in Ethiopia. Organization of the rural muturu farmers into cooperative breeding scheme aside genetic improvement of their herds, may also assist the rural farmers to increase their economies of scale to access inputs, services and profitable markets. Structured selective breeding schemes are not available in Nigeria for the muturu cattle. The cooperative breeding group could form a basis for designing structured breed-level breeding program. Institutions could collaborate/coordinate to expand and institutionalize individual cooperative breeding activities, standardize the breeding scheme designs, provides technical coordination, organize central databases, input value-addition and value chain intervention activities. To catalyze the formation of “self-help” type cooperative, its sustainability, ownership, labor and operations, the management of the cooperative breeding scheme should focus on overall improvement in addition to breeding techniques. It must be ensure that it is completely owned by members. However, a structure to ensure that members acquire the capacity for the wholistic ownership and management of the scheme must be put in place. For successful implementation, management and sustainability of the rural cooperative breeding scheme, the management must focus on overall improvement to include husbandry, health, nutrition, value-adding activities, innovative marketing and links to stable markets. These, has to be built into the scheme to empower farmers to be able to do much of these on their own. It is conventional that a breeding program must be incentivizing to encourage farmers and attract the participation of new members. The common challenges of the rural muturu farmers are access to market, marketing, competitive pricing and prices. The rural cooperative breeding scheme may provide avenues for product output to the market at every stage, as a result of culling value-addition activities like fattening, innovative marketing and cooperative links with stable markets may ensure that animals fetched competitive prices. The cooperative can also introduce plan mass production and spread of calving through synchronized breeding during the best seasons to maximize calf survival and higher economies of scale to access profitable markets. This may provide additional income that is incentivizing and an economic driving force for sustained implementation of the cooperative breeding scheme and attract new members to the scheme. For successful implementation, management and sustainability of the rural cooperative breeding scheme, its ownership must be in the hand of members. The management must focus on overall improvement to include husbandry, health, nutrition, value-adding activities, innovative marketing, links to stable markets and training for capacity building of members to empower farmers to be able to do much of these on their own. The cooperative breeding scheme will offer the opportunity for key value chain intervention activities through the development of improved inputs /service supply system to improve genetic potential of animals, hormone assisted mass breeding, spread of calving, value-addition activities, fodder production, feeding systems and animal health delivery. The Population of the savannah muturu cattle have declined to such a level that their survival is been threatened and is highly endangered and no doubts on its way to extinction unless urgent steps are taken to conserve and improve it performance. These steps must include not only conservation and genetic improvement strategies, but as a must value chain intervention and value addition strategies, capacity building of rural farmers to apply genetic improvement, value chain and addition methods themselves. The genetic resources of the savannah muturu even though had being diluted over the years, the breed still retain it co adapted genetic complexes and it uniqueness that were maintained among rural farmers. The populations of the savana muturu under rural farmers were highly inbred. The levels of indiscriminate crossbreeding with the Zebu cattle were also minimal. The co-adapted gene complexes for adaptation and fitness of the savanah muturu to the Nigerian tropical conditions had not being separated. The economics driving force for production of the savanah muturu is very poor, even though the animals are expensive, sales are occasional, farmers could not sell their animals as when due, as the animals are only demanded during special occasions. The following steps must be taken to ensure that, the genetic resources of the savana muturu is improved and not to go into extinction. 1. Government and Non-governmental Organizations must ensure that Savana muturu herds under rural farmers must be organise to form rural cooperative breeding scheme so that genetic improvement strategies can be applied on the cooperative herds. 2. Value chain intervention and value addition strategies should be introduce to the rural muturu farmers for adoption. 3. There is need to introduce capacity building programs for the rural savanah muturu farmers to be able to apply genetic improvement, value chain intervention and value addition activities themselves. 4. There is need to create a stable markets for competitive pricing and prices which will wholistically develop an economic driving force that will not only motivate muturu farmers, but may attract more rural farmers to go into savanah muturu production. This will enhance sustain use of the breed “the best conservation strategy. Adebambo OA. The Muturu: A rare sacred breed of cattle in Nigeria. Animal Genetic Resource Information. 2001;31:27-36. Mason IL. A world dictionary of livestock breed types and varieties. 3rd edn. Wallingford, UK. CAB International. 1988;348. Maule JP. The Tropics Cattles, Centre for Tropical Veterinary Medicine, University of Edinburgh. Redwood Press Limited, Melksham, Wiltshire. 1990;65-68. Adeneji KO. Review of endangered Cattle breeds of Africa .Animal Genetic Resources in Africa .OAU /STRC/IBAR, Nairobi, Kenya Second OAU Export committee meeting on Animal genetic resources in Africa Bulawayo, Zimbabwe. 1983;20-5. Adeniji KO. Review of endangered cattle breeds of Africa in Animal Genetic Resources in Africa: high potential and endangered livestock 2nd OAU Expert committee meeting on Animal Genetic Resources in Africa, Bulawayo of Zimbabwe, Nairobi, Kenth. 1985a;20-32. Felius M. Cattle breeds: An encyclopedia. Misset Doetinchem (the Netherlands) 1995;799. Adeniyi KO. Proceedings of expert committee meeting, animal genetics resource in Africa. Bulawayo, Zabawe. 1985b. Rege JEO, Tawah CL. The State of Africa Cattle Genetic Resource II. 1999;1-26. Roberts CJ, Gray AR. Studies on trypanosome resistant cattle, breeding performance of the N’dama, Muturu and Zebu maintained under the same condition of husbandry. Tropical Animal Health Production. 1973;5(4):211-9. Epstein H. The origin of the domestic animals of Africa Vd 4Newyork, USA Pub Africa.1971. ILCA. Trypanotolerant Livestock in West and Central Africa. ILCA monographs 2. ILCA, Addis Ababa. 1979;2. Gwaza DS, Momoh OM. Endangered indigenous Cattle Breeds of Nigeria a case for their conservation and management. World Scientific News. 2016;30:68-88. Lande R, Barrowdough GF. Effective population size, genetic variation and their use in population management in M.E Soule editor. Viable population for conservation. Cambridge University press Cambridge England 1987;87-124. Shaw APM, Hoste CH. Trypanotolerant cattle and livestock development in west and central Africa FAO .Animal production Health Paper. 1987;1. Ronningen K, Lampkin K, Gravir K. Zebu Cattle of East Africa .The influence of environmental factors on some traits in Boran Cattle .Swedish. Journal of Agricultural Research. 1972;21:209-17. Fricke W. Cattle husbandry in Nigeria. A study of its ecological condition social geographical differentiation. Heldeberger Geographischew Arbelten Geographischin Institute Dar Universitat Heldel by. 1979;330. Rim. Nigerian livestock resources. National synthesis Report by Resources Inventory and management Limited (RIM) to Feed Dept. of livestock and pest control services, Abuja, Nigeria. 1992. Geoff S. Genetic improvement of cattle and sheep. Farming press. 1998;446. Akinwunmi KA, Ikpi AE. Trypanotolerant cattle production in Southern Nigeria Report to International livestock centre for Africa (ILCA) Humid zone programme, Ibadan, Nigeria. 1985;31. Wright S. Size of population and breeding structure in relation to evolution. Science. 1938; 87:430-1. Wright S. Evolution and Genetic of population, Experimental results and evolutionary deductions. University of Chicago press Chicago Illinois. 1977;3.